Hardin-Simmons sophomore running back Bryson Hammonds (Coleman, Texas) ran for a career-best 205 yards and five touchdowns on 16 carries in the No. 7/8 Cowboys’ 83-6 victory over McMurry. He also had two receptions for 37 yards and another score to earn his second Player of the Week award of the season. Southwestern junior quarterback Frederick Hover (McAllen, Texas) accounted for 520 of the Pirates’ 555 yards of total offense in their 59-35 win over Texas Lutheran. He was 30-of-44 passing for 443 yards and five touchdowns and added 77 yards on the ground with another score for his second Player of the Week of the season and fifth of his career. Louisiana College senior cornerback Travon Long (Lutcher, La.) ended his career by helping the Wildcats to a 45-13 win over Howard Payne. He forced two turnovers in the game, forcing and recovering a fumble on a strip sack, and intercepting a pass. He added another 1.5 tackles for a loss among his eight total stops and broke up another pass. 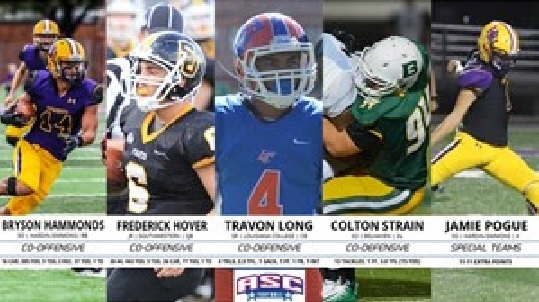 Belhaven sophomore defensive lineman Colton Strain (Clinton, La.) had a career-high 13 tackles with a forced fumble in the Blazers’ 8-0 road win at Sul Ross State. Strain also nailed 3.0 for a loss of 15 yards and held the Lobos to just 96 yards of offense. Hardin-Simmons sophomore kicker Jamie Pogue (Abilene, Texas) was 11-for-11 on extra point attempts, setting the school record PATs made in a season 67, in the No. 7/8 Cowboys’ 83-6 win over McMurry. Louisiana College senior wide receiver Drake Battaglia (Thibodaux, La.) totaled 244 all-purpose yards and three touchdowns in his final game as a Wildcat in a 45-13 win over Howard Payne. He caught eight passes for 167 yards and two scores and added 77 rushing yards, 75 of which came on a TD run. Mary Hardin-Baylor senior running back Markeith Miller (Garland, Texas) ran for 173 yards and three touchdowns on 24 carries in the No. 2/2 Cru 50-15 win at East Texas Baptist. He tied the program and ASC rushing touchdown career record with 57 and is closing in on the career rushing yards record. Howard Payne junior wide receiver DunTayviun Gross (Tyler, Texas) finished with 13 receptions for 106 yards and a touchdown for his third 100-yard game of the year in the Yellow Jackets’ loss at Louisiana College. Hardin-Simmons senior linebacker Eriq Mitchell (Lago Vista, Texas) had six tackles and returned a fumble 25 yards for a score as the No. 7/8 Cowboys allowed just 164 yards in an 83-6 win over McMurry. Mary Hardin-Baylor sophomore safety Jefferson Fritz (Kaufman, Texas) intercepted two passes and returned them 75 yards to set up a pair of scores in the No. 2/2 Cru’s 50-15 win at East Texas Baptist. He also added two tackles as UMHB limited the Tigers to just 284 yards of offense. Fritz tied the UMHB single-season record for interceptions and is one off the ASC record. Southwestern freshman defensive back Aaron Robinson (Spring, Texas) had a 68-yard interception return for a touchdown in the first quarter of the Pirates’ 59-35 win over Texas Lutheran. He also broke up two more passes and had five tackles. Howard Payne junior linebacker Austin Killgore (Tarkington, Texas) led the Yellow Jacket defense with eight tackles, 2.5 for a loss and a sack in the Yellow Jackets’ loss at Louisiana College. Mary Hardin-Baylor freshman punt returner Aaron Sims (Cameron, Texas) returned a punt 40 yards to tie the school record for his fourth punt return touchdown of the season in the No. 2/2 Cru’s 50-15 win at East Texas Baptist. Belhaven senior punter Zach Shemmel (Clinton, Miss.) tallied seven punts for an average of 41.7 yards and a long of 58 in the Blazers’ 8-0 win at Sul Ross State. Texas Lutheran senior kick returner D’Andre Gallagher (Cuero, Texas) returned a kickoff 83 yards for a touchdown in the Bulldogs’ road loss at Southwestern. He also had a 42-yard TD catch in the game.